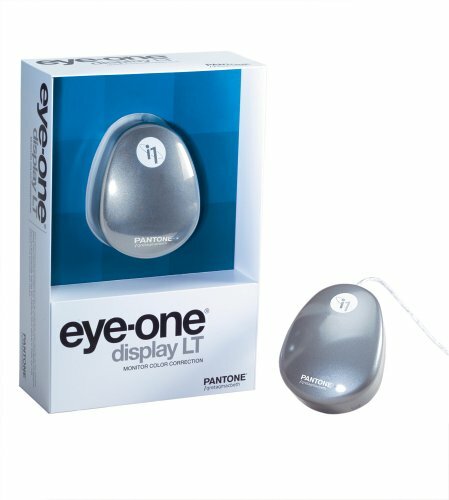 The Eye-One LT can become an Eye-One Display 2 through a firmware update which then unlocks additional software features. The firmware update costs around double the price difference between the LT and the Display 2. If you are a casual user wanting to go cheap, the Eye-One LT is for you. If you're a tweaker, save yourself time and money and buy the Eye-One Display 2. With that said, the tool worked quickly and easily on my HP LP2475W, MacBook Pro, and Dell D620. The picture quality was dramatically improved. The best picture on the MacBook Pro did come after upgrading to the Display 2 so that I could use the native color temperature of the MBP. It also allows calibration of brightness. I suspect that this device was optimized for a CRT screen and not and LCD screen because it was absolutely a nightmare to get to work and even when it finally finished, the effect was horrible. First of all, other reviewers who say that the documentation included with the product is useless, well, that is just the tip of the ice-berg. Yes, the little pamphlet that comes with it doesn't even give you enough information to understand that the proper way to install the software, which thanks to the amazingly unintuitive CD software has to be some of the worst software installation I've ever experienced. There are 4 components, each with a separate install (and none of which actually say install). Funny thing is, after you install them, you only show 3 items in the programs files. Second, once you've installed and look at the on-line tutorials, it seems that the process is potentially easy. The only problem is that the software provided doesn't match what they show in the tutorial! Most glaring is that the product claims to have an easy 1 click mode which seems to just not be there (this might not be available when calibrating LCDs, but again, nowhere does it state this, so I'm just guessing). Third, the program takes you to a contrast adjustment step. Guess what? LCDs DON'T HAVE CONTRAST ADJUSTMENT! I was able to get a slider through the Nvidia tray to try to get past this step, but it wasn't until I trudged through their horrible support site that I found that they just expect you to skip this step. The most basic question is: if you click the button for LCD, why the heck does it even take you to this step if they expect you to SKIP IT? Which brings me to their support site. Talk about horrible. It is next to impossible to find the product to begin with because it doesn't recognize the complete name of the product in the search engine. They have truncated the name and if you actually type it out AS IT APPEARS ON THE PRODUCT it doesn't recognize it! Wow... just wow... Phone support consists of leaving a message. Email support consists of filling out a form which doesn't even seem to be oriented toward product support (it kept asking me if I was planning on investing in the company... YEAH RIGHT). So after almost three hours of playing around with it, I finally got it to a point where it seemed to run through some sort of calibration, when the program finished, it made the screen look like utter crap. There is NO way that the product of that process was anywhere near where it should have been. I purchased one to calibrate multiple displays in my home. Calibrating computer monitors is very quick and easy with the included software. With just a few clicks the automated process begins. When it's finished, your display has bright, vibrant coloring. Very pleasing to the eye, but I have no method of checking accuracy other than "it just looks right". I give this three stars because it does work well, but the "out of the box" experience is poor and it takes a fair amount of work plus trial-and-error to figure out how to use it properly. The Eye-One display LT can be used to calibrate CRT and LCD monitors. Inside the box there is the calibration "dongle" (looks a bit like a mouse), counterweight (clips onto the USB cord), ambient light cover, CD with software, and a brief, multi-lingual "getting started" guide. I highly recommend watching the training video on the CD as it gives you a much better set of instructions and it's far clearer what to do. The software does actually work quite well, but you have to know what you're doing -- you won't be able to figure it out completely unless you've seen the video. Getting the dongle to lie flat on my LCD screen was a real challenge, because the thick plastic coated USB cord won't bend around the sharp top edge of my screen; it tends to lift it off. In the end I used the counterweight (supplied) to hang the cord down flat. And thus, after two false starts, on my third calibration attempt I got a good result. Step #1: Take a pair of pliers and twist the included installation disk until it breaks and then throw it in the trash. You will be far ahead if you do. Step #2: Go to these web sites and download the latest software. Step #3: Install the application software. Then make a subdirectory in the application folder called USB Drivers. Copy the drivers from the second link above into the USB driver folder. Step #4. Go to the control panel and click install hardware. Select the USB driver folder to pick the appropriate driver. Step #5: Rename the stupid GretagMacbeth program startup folder to something logical like Eye-One Display. The CD installed 3 software executables without any desktop shortcuts. The sparse documentation gave no hint of which of the 3 modules to start with. I ran "Eye-One Diagnostics" and it could detect the device. Vista complained that the driver was not digitally signed. I finally hunted around on the xrite web site to find and download the correct driver, and then I had to hunt through the Vista hardware device list to find the Eye-One and install the driver files. Be careful with this one. Little documentation, and not all monitors can take advantage of the automatic calibration feature, one of the reasons I bought it. My monitor was not one of the supported monitors. I tried to use it on my macbook and i kept getting washed out colors. I called xrite and they said that you have to upgrade the software for another $99. I was amazed with amazon's streamlined return process. 2 thumbs up!